50 years ago this month, President Johnson declared an “unconditional war” on poverty in America. With the help of Congress, he passed over 200 pieces of legislation to battle the startling statistic of 37 million Americans in poverty. This war on poverty is most infamous for its formation of a welfare state in America, a state which has sapped innovation and productivity in the private sector. Despite this clear fact, progressive liberals point to a substantial reduction in the poverty rate during Johnson’s term in office as evidence that increased government aid really does work. By the time LBJ left the White House, the poverty rate had been reduced to just 12.1%. Four years later, in 1974, the rate was at one of the lowest points ever at 11.1% To the casual observer, the facts may seem to support the liberal argument of today that more government aid is necessary to lift America’s poor out of desolation. However, those same progressive liberals forget to show you this graph, which shows the true impact of the war on poverty. 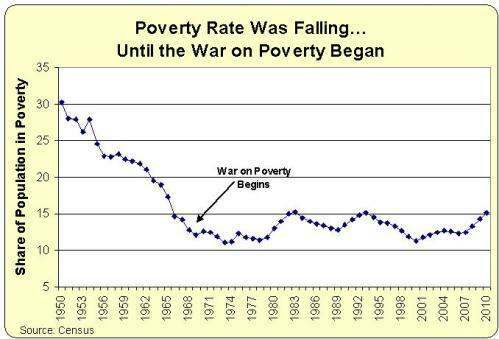 Poverty was decreasing steadily until LBJ’s war began. According to the 36th president, this war was meant to “cure” and “prevent” poverty in America. If that were the case, then why is the poverty rate so much higher today than before the war began? Why has the poverty rate grown despite the growth of the welfare state over the years? Was it because the Reagan administration resisted the growth of the welfare system? No, just look at the dip in the poverty rate during the ’80s in the above graph. Was it because of the drastic reforms made to the welfare system during the Speakership of Newt Gingrich? No, just look at the dip in the poverty rate during the ’90s in the above graph. The trend is clear. In the long term, as welfare spending has gone up so has the poverty rate. At a time when the national debt stands at 17 trillion dollars, welfare spending is growing faster than any component of government spending. Federal funding for food stamps alone has increased by over 160% since just 2005. And what are the results of this increase? Nearly 50 million Americans are in poverty today, and 15% of the population relies on food stamps. Democrats say that the welfare system keeps poor Americans afloat, but soon enough the federal government’s irresponsible spending programs will drown us all. Whatever the case, the welfare state has proven unable to actually lift poor Americans into true prosperity, as LBJ promised it would. The best way to build disposable income for poor Americans is for them to find a job. The best health insurance is a job. The best way to put food on the table is a job. And the best way to find jobs for these poor Americans is to get government out of the way of the private sector so businesses can hire and expand. It really does seem that the welfare going to the most vulnerable in our society is repeatedly under attack, while the welfare to the wealthiest often goes unnoticed. Look at the numbers coming from our federal government. The Joint Committee on Taxation estimates that from 2011-2015, we’ll spend $143 billion in tax subsidies to homeowners. Over $71 billion will go to those making over $100k/year, while less than while only $41 billion will go to people making less than $50k/year. In 2012 we spent $270 billion in total subsidies to housing-related programs, and the majority of that money goes to rich people. Why are we giving millionaires enormous subsidies and not spending that money on the homeless? And why isn’t the big tax giveaways to the rich basically unquestioned- but we always see programs for the poor under attack? -Non-poor Europeans’ average living space per person: 395.7 square feet, 10% less than America’s poverty class. -American non-poor average living space per person in 1993: 721.2 square feet, 45% more than non-poor Europeans. The EU is now in the process of taking away larger size electric appliances from consumers, saying they consume too much energy. -Cars in the EU have shrunk to the size of large covered motorcycles. But all those socialists and democrats who bring “live small” into our lives will feel good about themselves, and that’s what matters most…right?